Although I’ve played around with several 12″ afghan square designs, this is my very first pattern that I’ve completed. Maybe it’s just me, but I find them a bit harder to design. But with a bit more practice I should get the hang of it, and hopefully I’ll finish all those WIP’s that have been sitting around for a while. 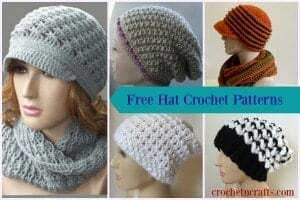 As for the square, you can see I crocheted it up in a slight color variation, so feel free to stray from the pattern and do your own sequence that you and your family will enjoy. Yarn: Vanna’s Choice in 4 colors. #4, medium weight. Standing Bullion Stitch (Stbs): Place Slip Knot on hk, and rep from * on Bs. Standing Single Crochet (Stsc): Place Slip Knot on hook and finish the sc as normal. If you’ve never worked a standing crochet stitch before, you might want to check out this tutorial on Standing Crochet Stitches. Fasten off colors as you finish them and weave in ends to prevent ravelling. Change colors up as desired. Rnd 1: With CA, Ch 3, work 8 bs into first ch; with CB, join with sl st in first bullion st. FO CA. Rnd 2: With CB, Ch 1, work 2 sc in same st as join, sc in next ch, *2 sc in next st, sc in next ch; rep from * around; with CC, join with sl st in first sc. (16 sc) Carry CB up for rnd 4. Rnd 3: With CC, Ch 1, sc in same st as join, *sk next 2 sts, work 5 bs in next sc, sk next 2 sts, sc in next sc; rep from * around omitting the last sc; with CB, join with sl st in first sc. (20 bs and 4 sc) FO CC. Rnd 6: Sl st into ch-4 sp, ch 1, (sc, ch 5) in same sp and into each sp around; join with sl st in first sc. (12 ch-5 sps) FO CB. Rnd 8: Ch 1, sc in same st as join and into each st and ch around, working 3 sc into each corner ch; join with sl st in first sc. (88 sts) FO CD. Rnd 9: Sk st where join was made. With CA, work Stbs in next st, *[sk next st, bs in next st] up to 2nd st from corner, work 3 bs in corner st; rep from * 3 times, then rep bet [ ] to finish the rnd; with CD, join with sl st in first bs. (52 bs) FO CA. Rnd 11: Ch 1, sc in same st as join and in each st around, working 3 sc in each corner; join with sl st in first sc. (120 sts) FO CD. Rnd 12: Sk st where join was made, With CC, work a stsc in next st, *sk next 2 sts, work 5 bs in next st, sk next 2 sts, sc in next st; rep from * around omitting the last sc; With CB, join with sl st in first sc. (20 bs groups for a total of 100 bs sts) FO CC. Rnd 13: With CB, Ch 4 (counts as first tr), work another 2 tr in same st as join, *[sk next 2 bs, sc in next ch-1, sc in next bs and ch-1, 3 tr in next sc]; rep bet [ ] up to 5 bs group at corner; sk next 2 bs, 2 sc in ch-1, 3 sc in corner bs, 2 sc in ch-1, 3 tr in next sc; rep from * 3 times, then rep bet [ ] once, sk next 2 bs, sc in next ch-1, sc in bs and ch-1; With CD, join with sl st in first tr. (136 sts) FO CB. Rnds 14-15: With CD, Ch 1, sc in same st as join and into each st around working 3 sc in each corner; join with sl st in first sc. FO. 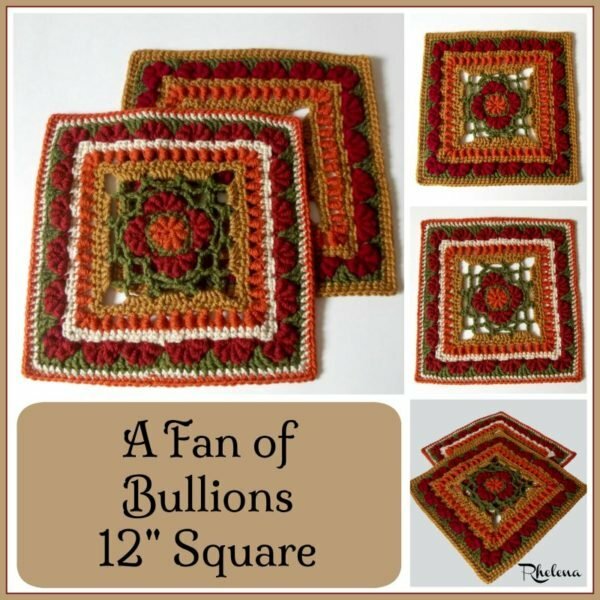 Visit CPB for more FREE 12″ Afghan Square Crochet Patterns.